The Centoventi – or ‘120’ in Italian – may not be named after the Panda, but its heritage is clear to see. Like the classic city car, it’s hugely versatile, small and manoeuvrable, and packed with really simple but clever ideas. The all-electric Centoventi has been designed with a modular battery system. Buyers will be able to opt for a ‘base’ model with a single battery and a range of just 62 miles. However, it’s possible to buy or rent up to three extra batteries, giving the possibility of up to 310 miles of range if it’s needed. Thanks to a sliding rail system for installation, Fiat says the battery swap can be undertaken in less than five minutes by a service centre. Fiat also says the mounting points for the batteries mean that adding or removing them doesn’t affect the Centoventi’s weight distribution or driving dynamics in any way. Paying homage to the original Panda’s modular dashboard and reconfigurable seats, the Centoventi will offer a hugely customisable interior. 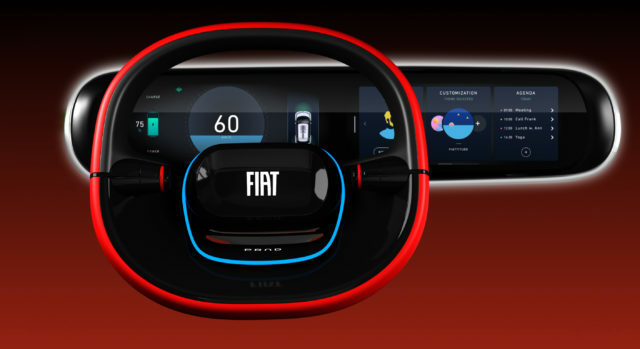 The dashboard takes the form of a full-width shelf, and in a clear nod to history the controls, dials and gauges sit on the steering column in a single pod. 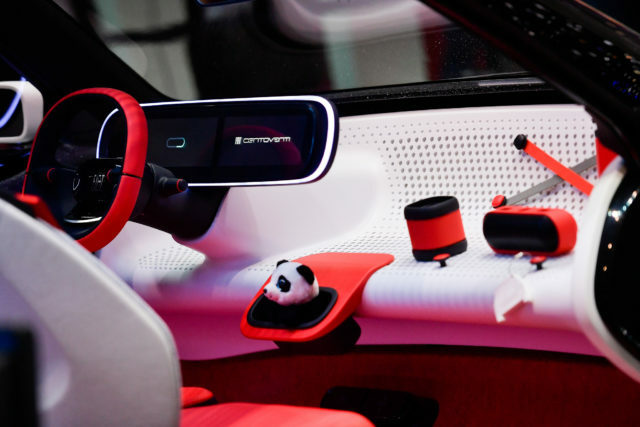 Rather tellingly, Fiat had placed a plush panda toy in the cup holders on the show stand. The dashboard is filled with holes, into which features and accessories can be fitted using a Lego-like interlocking mounting system. Fiat promises an ‘extensive’ catalogue of accessories. The open-top Centoventi can be fitted with fabric or hard roofs – including one with a built-in solar panel. Of course, the car can be charged traditionally, and taking inspiration from a popular vacuum-cleaner, the charging cable’s concealed on its own reel just underneath the windscreen. Though the Centoventi concept remains just that – a concept – it’s likely to preview Fiat’s future plans for city mobility. The connection to the Panda suggests that it’s a look towards a future, all-electric model. That couldn’t come soon enough, given that the current model Panda recently scored a dismal zero-star Euro NCAP safety rating, suggesting that the ten-year-old design is past its prime.